I have never been able to wrap my mind around the world's population. I couldn't see myself in the sea of people, let alone see how I could make an impact on such a vast number of individuals. But I can if I change my perspective. Visualize with an analogy. It's a way to change the perspective of a concept that's hard to grasp to something more tangible. 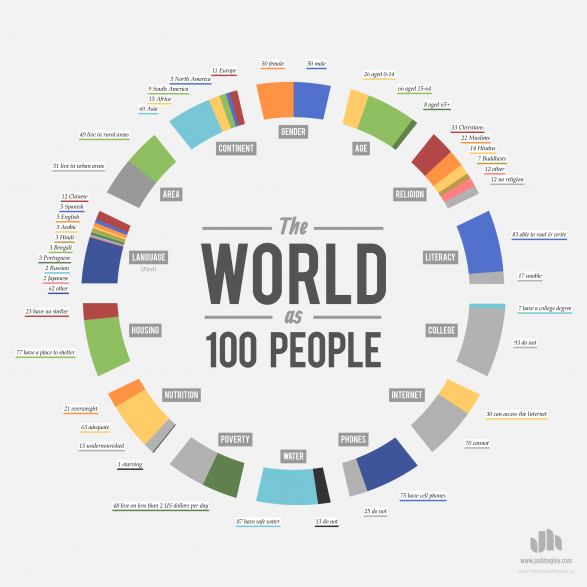 Here's the world's population, but scaled to 100 people. by JackHagley. Explore more infographics like this one on the web's largest information design community - Visually.